Have you repaired your power outlet or Electrical Switchboard more than twice? If yes, then it is the time to change it. There are a few things you should never take a risk with. If you really care about your family, then get a new electrical switches, and stay assured. It becomes tough to figure which brand to buy, do not worry. 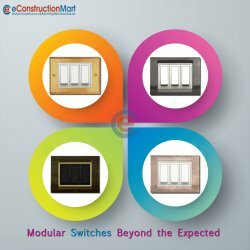 Visit httpwww.econstructionmart.com/Deals/Electrical-Products-Accessories, and select out of various Electrical Switch brands, like, Anchor, Neptune, Nihir, and Oreva. Sit online, choose your preferred brand, and receive it at your doorstep within a few days. Is not that great?